Description: The construction of a new storm water pumping station, housed inside a deep shaft, to replace the existing pumping station on Blackpool’s world famous promenade. 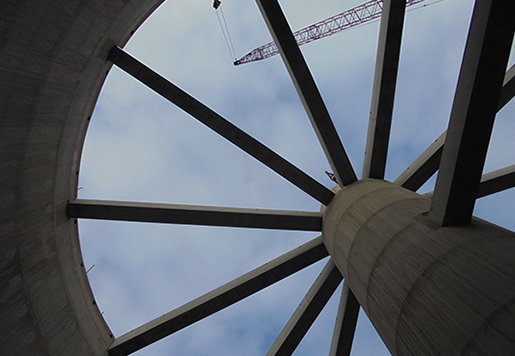 Ward & Burke were contracted for the design and construction of a 30m diameter caisson and interconnecting pipework. Our involvement included all permanent and temporary works design and the project was delivered with great success. The sinking of the caisson was undertaken and managed directly by Ward & Burke operatives and engineers. 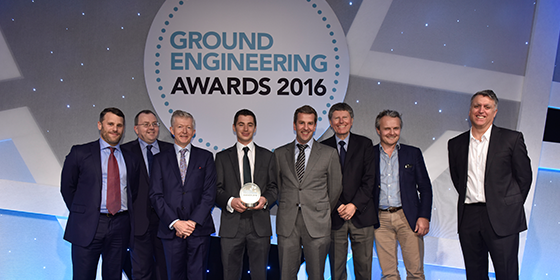 The Anchorsholme Park Detention Tank, led to Ward & Burke being shortlisted for two awards at the 2016 Ground Engineering Awards in London; Contractor of The Year, and the Health and Safety Award, winning the latter. A number of innovative techniques were used to construct the caisson with particular attention on the management and coordination between the permanent and temporary works throughout the project. 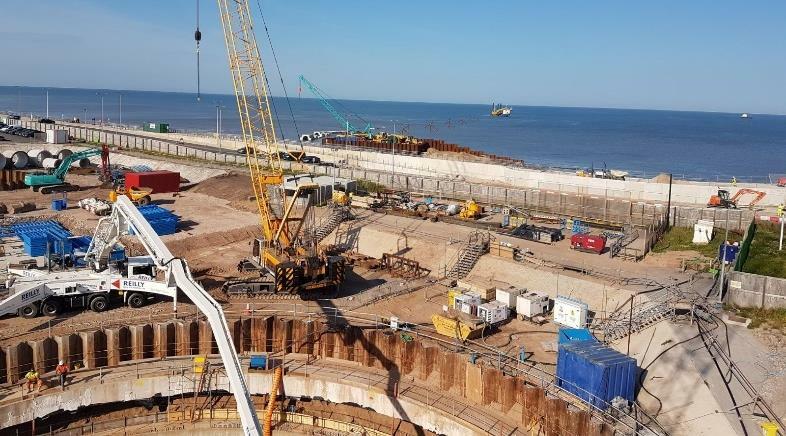 In order to aid the construction of the new shaft it was necessary for Ward & Burke to install a dewatering system to separately target the Upper and Lower sand horizons. To do this we utilised our Conrad and Soilmac SM10 drilling rigs, which have been successfully used for the installation of similar systems nearby. The approach to construction of the shaft was unique, as the in-situ caisson was sunk entirely under its own self-weight – no jacking system was used. This was one of a number of innovative techniques used to construct the tank, which is one of the largest sunk caissons ever constructed in the UK. The Health & Safety Award for Anchorsholme was a direct result of Ward & Burke’s in-house capabilities to design, fabricate and implement onsite an innovative spiral climbing formwork system which was designed for the construction process. It consisted of fully integrated access platforms and a panel system which is constructed at wall formation level, therefore designing out significant working at heights risks. 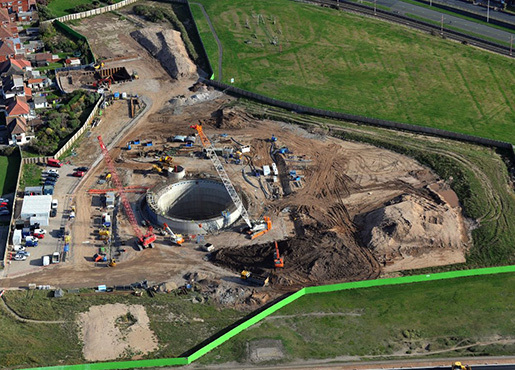 Ward & Burke’s approach led to concrete works for the in-situ caisson being completed 4 weeks ahead of schedule. The system exceeded all expectations and completed walls 30m in height without once lifting a panel or platform after the initial build phase at ground level. The challenging ground and site conditions led to the development of many practical innovations to ensure the project was successful. Groundwater was located approximately 6m below ground level and due to the location of the site there was a strong tidal influence on the groundwater levels, and so a charged aquifer was located 12m below the final formation level of the caisson. The lifting of panels in situations of increasing wind can present a major concern for health and safety on sites and so was significantly reduced. The formwork system pulls itself along using pulleys and winches which are remotely operated, therefore reducing the labour requirements seen in other systems. A central vibrating platform was developed to reduce the risk of repetitive strain injury and hand-arm vibration during the works. The system significantly reduced the number of tie holes through the form by utilising an “up and over” space frame. This also reduced the man hours spent in a confined space of a wall clearing rebar and placing ties. 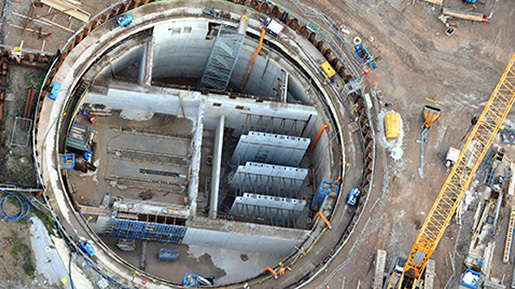 In addition to the design and construction of a 30m diameter caisson at Phase 1, Phase 2 works included a storage tank, outfall and tunnelling works and design and construction of a 35m diameter x 27m deep shaft using in-situ caisson methodology.